Your garden is your sanctuary – a place to relax with your morning coffee, play a little fetch with your Labrador, and entertain friends on summer evenings. But if your dog is digging, your yard and garden may look more like an expansive moonscape than a garden retreat. Your Labrador’s digging habit makes for an unsightly landscape, but it can also be both dangerous and expensive. This is one habit you should curtail – and sooner rather than later. This article will cover everything you need to know about your dog’s inspired digging habit and the steps you can take to reclaim your yard from your enthusiastic gardening pooch. 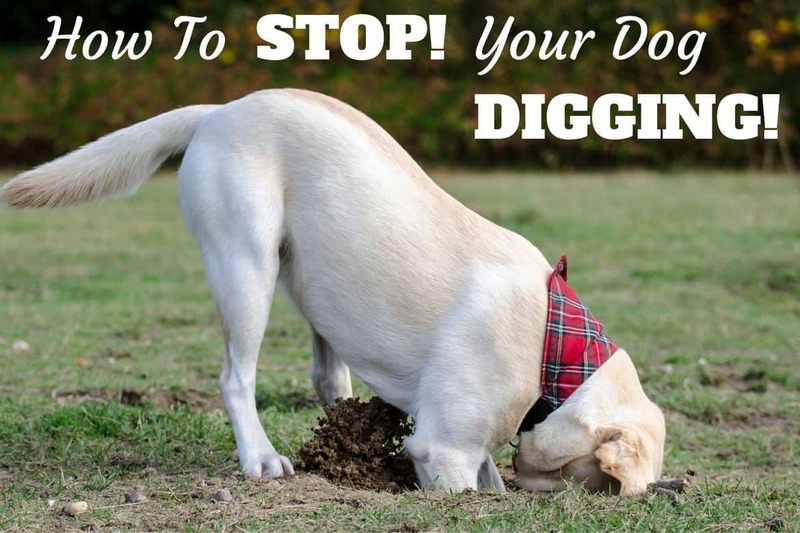 Read on to learn how to stop a dog from digging. It started harmlessly enough – your curious puppy sniffing around in the rose garden, scratching in the mulch, and trying to peer under the fence. But lately that simple curiosity has taken a destructive turn, and your Labrador is tearing up the grass, pulling out plants, and generally making a mess of things. You want this behavior to stop now, but you don’t know where to begin. 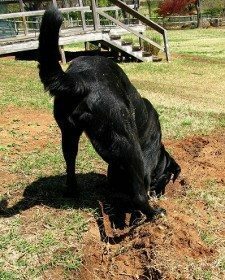 First, you should know that digging is a normal and instinctive behavior for dogs, especially Labradors. Your pup’s ancestors dug holes to bury food, and dug cozy dens to protect their young from harsh weather and predators. But, just because the behavior is normal doesn’t make it okay. Your dog lives in your home and must play by your rules. 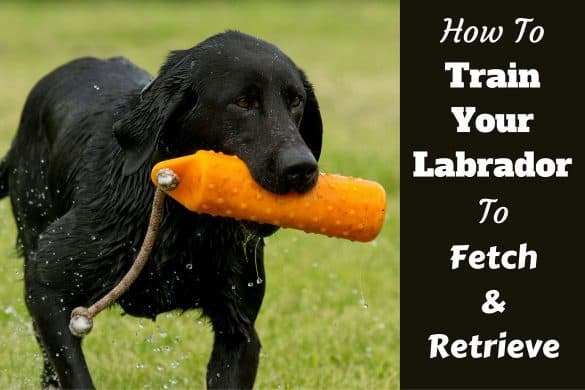 Before you get anxious and start fretting over your dog’s behavior, you should rule out easy-to-solve issues that may be causing your Labrador to dig. Simply by meeting their basic needs throughout the day, you might inadvertently solve the digging problem before it gets out of hand. Make sure your dog gets enough exercise every day. Depending on your pup’s energy level, this will mean one or two walks a day for 30 minutes or more. According to the Karen Pryor Clicker Training website, insufficient exercise is the leading cause of problem behaviors. Keep your dog company. Your dog may just be lonely and bored. Spend time playing and interacting with your dog every single day. You can teach them new tricks, work on training, or just hang out together in the garden. Give your dog something to chew on. Your dog’s need for chewing doesn’t go away when they leave puppyhood behind. In fact, all dogs will benefit from healthy chewing, and a good bone will keep your dog happy for a long time. Nothing to chew can lead to boredom, boredom can lead to digging. Make sure your pup has shelter from extreme climates. Dogs often dig to keep cool in the summer or warm in the winter. If you are leaving your dog outside for any length of time, be sure to give them shelter from sun, wind, and rain. Otherwise, they will try to create shelter themself. Okay, you’ve ruled out all the simple reasons above for why your dog might be digging. Now it’s time to “dig” into the more complicated issues. 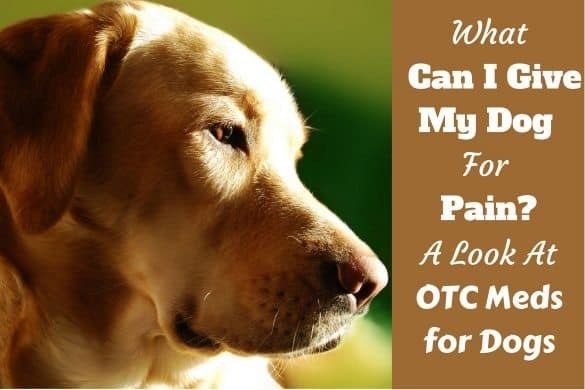 Labradors, however sweet and eager to please, are complicated animals and when trying to solve a behavioral issue, it’s important to try to figure out what makes them tick.  Figuring out “why” a behavior occurs is crucial before attempting to modify the problem behavior. Here are a few more common reasons why dogs dig and why your Labrador could be tearing up your garden. Your dog is a puppy. Puppies have insatiable curiosity. They chew, tunnel, dig, and generally get into stuff because they are exploring their world. Digging is totally normal for puppies, and with minimal effort from you, they will probably stop digging as they approach their second birthday. 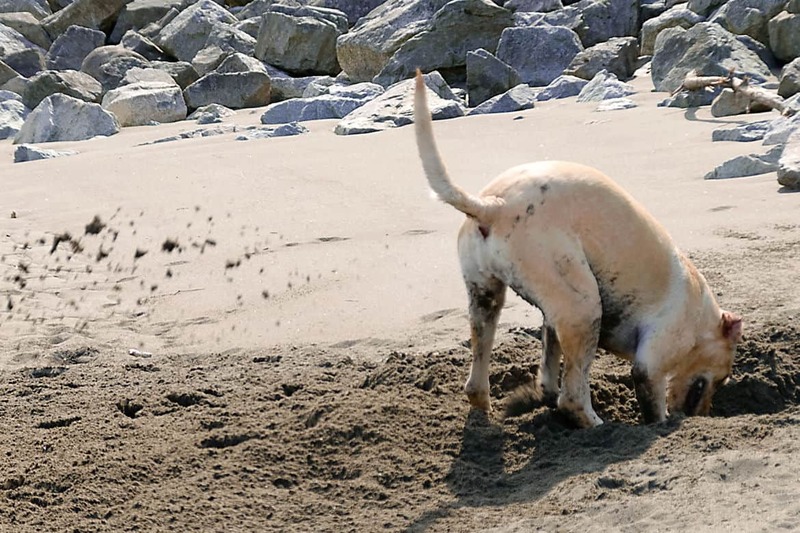 Your adult dog developed the digging habit as a puppy. 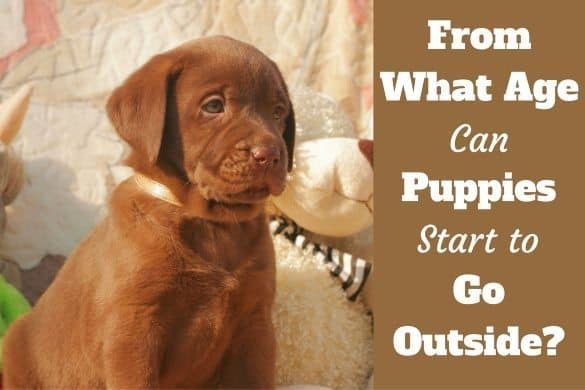 Remember that curious Labrador pup scratching in your flower beds? As a puppy, they started digging because they were curious. If they were never taught digging was wrong, or what they could do to satiate their curiosity instead of digging, they likely continued the behavior simply because they could. If never taught digging is off-limits, they will continue with this normal and instinctive behavior. Your dog has separation anxiety. Destructive behavior often occurs when dogs feel anxious left alone, and your dog may be digging because they’re in distress. Digging could mean they are trying to escape from their loneliness or they’re trying to keep themselves occupied with destructive behavior until you return. For more about separation anxiety symptoms and solutions, check out this article where we dicuss it. Your dog is trying to escape confinement. This is another type of anxiety that stems from being closed in or confined. Maybe your dog’s needs aren’t being met within your fenced area, or maybe the rewards outside the fenced area are just too great to ignore. Your dog is eating soil, plants or roots. 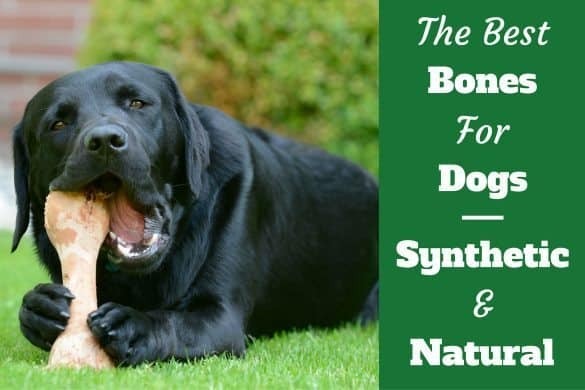 Your garden is full of tasty treats for undiscriminating Labradors, who may have a taste for certain types of soil or plants. This type of digging is easy to discover because holes are usually limited in number and focused around certain choice spots in your garden. Your dog is trying to bury toys or bones. This is another instinctive behavior that your dog may have inherited. It’s also a reason for digging that is very easy to spot. Watch your pup carefully when you give them a bone and see what they do with it. 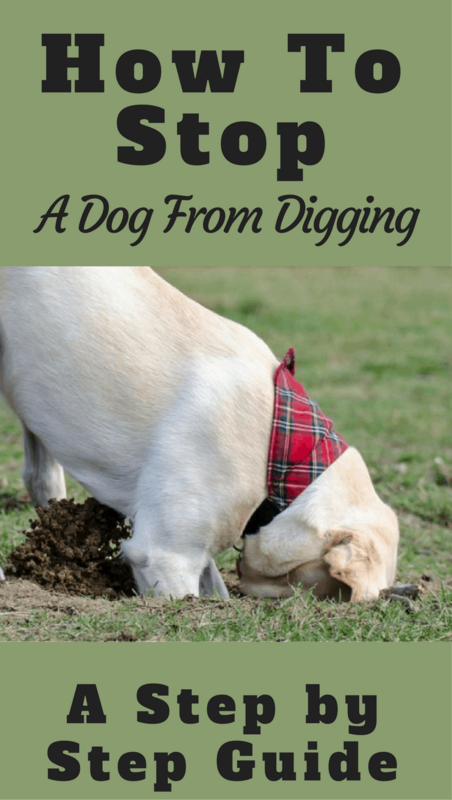 Now that you (hopefully) know why your dog is digging, you have to figure out what they’re getting out of the behavior. What is their reward for digging up your garden? Can you provide a similar outcome or reward that doesn’t encourage them to dig? Solving the problem of digging will be different for every dog and unique situation. Here are a few techniques that have worked for countless dog families with great success. Counter-conditioning is a common treatment for separation anxiety and the problems that stem from it. It involves teaching your dog to have a pleasant feeling (and reaction) to something they find unpleasant. In the case of digging because of anxiety, you would condition your dog to associate your absence with tasty treats, fun chew toys, etc. instead of fear and loneliness. With careful counter-conditioning using high-value rewards, your dog will begin to look forward to time alone. You can find more helpful information about counter-conditioning from the ASPCA. Many dogs dig because they aren’t sure what to do instead and they were never taught which behaviors are acceptable and which aren’t. Yes, this is our own fault, but there’s no need to place blame. Instead, work with your dog to teach them the right behavior now before it gets worse. 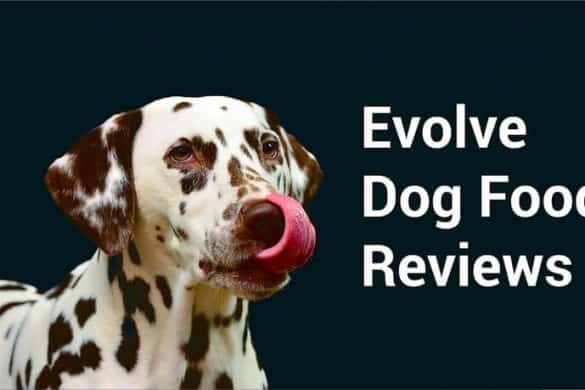 By using positive reinforcement, you can redirect your pup’s energy toward behaviors you approve of. We will be delving into this a little deeper in the step-by-step guide below. You can learn more about positive reinforcement from the Humane Society of the United States. If your dog has gotten used to having the run of the garden all day while you are busy elsewhere, bad habits like digging can easily form. If your dog hasn’t earned your trust, don’t leave them alone outside. Instead, let them out only when you’re able to supervise them. This will allow you to redirect negative behavior before it becomes a habit. Basically, never give them the chance to get away with it unnoticed. This strengthens the behavior and will make it harder for you to stop. So what do you do when you have to leave your dog unsupervised and you know they’re prone to troublesome behavior like digging? One solution is to restrict your dog to a crate when you can’t watch them. After proper crate training, your dog will be perfectly safe and happy in the confines of their cozy den. In fact, many dogs prefer the comfort and safety of a crate and will often seek it out on their own. Think of it as a sandbox for your dog, a place where they can dig, bury their bones and roll around without getting into trouble. Make the digging area attractive by burying your dog’s favorite toys and bones. This is especially useful if your dog is digging simply because they love to dig. You will have to train your dog to use the sandbox instead of your garden, but once they know the rules, it will be smooth sailing and you and your Labrador will be happy. To keep your dog from digging, you will have to follow a multidimensional process that will meet your dog’s physical, mental, and emotional needs while encouraging and rewarding the behavior you want to see. Step 1: Reread the section above – Your Dog’s Digging Problem May Be Easy to Solve and make sure you are providing them with enough exercise, shelter, company, and outlets for chewing. Once you are sure your pup’s needs are being met, move on to step 2. Step 2: While you are teaching your dog not to dig, you will have to supervise them whenever they are outside. Never leave your dog outside alone until you are 100% sure they can be trusted not to dig. Step 3: Spend time outside with your dog in places where they’ve been known to dig. Observe your dog carefully so you know when the digging will begin. Signs of digging might be intense sniffing, circling, or even whining. Step 4: When you see the signs your dog is about to begin digging, call them to you. When they respond, offer lots of praise and tasty treats as a reward. You can even spend a few minutes playing ball or training if that is rewarding for them. If you’ve created a special doggy sandbox, now is the time to show them that it’s okay to dig in this spot only. Hide their toys in the sand and praise your dog as they happily dig them up. Step 5: Every time your dog starts to dig where they aren’t supposed to, redirect the behavior. If, for some reason, your dog manages to dig a hole when you aren’t looking, don’t fret. Calmly fill in the hole while ignoring your dog. Then, end outside time until you are ready to practice again. Do not punish them and remember, this is your mistake for not following step 2 above. Supervise your pup whenever they are outside. I know, this is the 3rd (4th?) time I’ve said it in this article. It’s been done on purpose – because you’ll really remember and do it now, yes? This is critical while your dog is learning not to dig. Every time your dog is successful at digging where they shouldn’t, they will take a step backwards and the process will start over. Look out for behavior extinction bursts. What’s that you say? An extinction burst is a behavior modification phenomenon that occurs when an undesirable behavior increases before it ceases. First, read this detailed description of extinction bursts. Then, take heart; if you are prepared for extinction bursts, you won’t be so frustrated when they occur. Be patient. Behavior modification takes time and energy. Sometimes you will feel like giving up. You will feel like just letting the dog dig so you can get on with your life. I promise you, if you stick it out, the rewards will be well worth the effort and your garden will recover to it’s former beauty soon. Don’t be afraid to get a professional involved. Sometimes solving a behavior problem goes beyond what we are capable of. That’s where professional trainers and behavior modification specialists come in. Not only have they seen it all before, but they aren’t emotionally attached to the situation so they will have an easier time looking at the problem from every angle. Again, do not leave your dog unsupervised in the garden. This cannot be overemphasized (though I must be getting close? haha). Do not punish your dog for digging. This is counterproductive and will weaken your relationship with your dog and perhaps even instill fear when there should be trust. Do not fill the holes with water. This is recommended on several websites and it just doesn’t work. In fact, this may actually increase your dog’s desire to dig, especially with a Lab. It’s like playing in a giant, fun mud puddle. Digging. 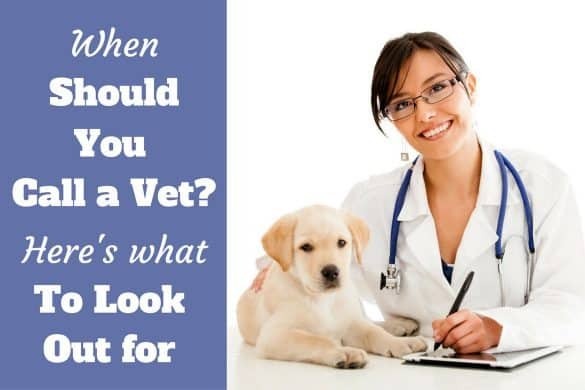 For your dog, it’s a perfectly normal behavior for all kinds of reasons; from basic instincts, to separation anxiety, to just wanting to keep cool. No matter what the reason is behind your dog’s digging habit, we can’t think of a single person who appreciates their dog’s attempts at landscaping. Putting an end to the behavior really is the best solution. Yes, it will take a bit of effort, but the next time you sit outside with your Labrador on a beautiful summer evening admiring your garden, you’ll reward yourself and your pup for the effort involved. Your garden will once again be a place of beauty and you’ll have developed a deeper relationship with your dog in the process. Not everyone can stay home, jobless. My husband and I work. We can leave our rescue puppies inside (chewing and potty traing not 100% yet.